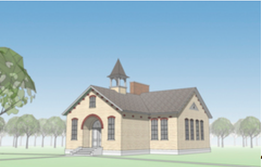 The Zeeland Historical Society is seeking funds to start a $280,000 renovation project on the former New Groningen schoolhouse on Paw Paw Drive. The Zeeland Historical Society is seeking funds so it can begin renovations to the former New Groningen schoolhouse. Historical Society manager Kit Karsten recently requested $25,000 from the Zeeland City Council and $22,000 from the Zeeland Township Board for the project. Karsten also plans to ask the Holland Township Board for funds later this month. "We're ready to renovate the schoolhouse. The society requests your participation in the renovation," he told area leaders. City Manager Tim Klunder said city officials are currently reviewing the request during their budget process. Zeeland Township Supervisor Glenn Nykamp said the Township Board also is evaluating the request and has yet to make a decision. Karsten said the society has already raised about $80,000 for the reconstruction from donations from the Zeeland Board of Public Works, Community Foundation of the Holland/Zeeland Area, and private donors. The Holland-based firm GMB Architects-Engineers has created renovation drawings for the project, which is estimated to cost a total of $280,000. The Historical Society plans to renovate the building on Paw Paw Drive, which was rented as a duplex, back into a two-room schoolhouse. The exterior renovation plans include restoring the Veneklasen brick exterior and the installation of the original bronze bell and historically correct wood windows. Interior renovations include reconstructing the school's coat rooms and classrooms, restoring the original tin ceiling and hardwood floors, installing historic desks and light fixtures, and mechanical, plumbing, and electrical work. The building was used as a schoolhouse from 1881 to 1951, when the current New Groningen Elementary School, at 10542 Chicago Drive, was built. The Historical Society plans to use the restored schoolhouse as a community meeting place, for educational programs, and a place to house the schoolroom exhibit, which is currently at the Dekker Huis Museum, 37 E. Main Ave. The Historical Society bought the building in April 2006 for $154,900. At the time, the City of Zeeland provided $10,000, Zeeland Township offered $5,000, and Holland Township gave $50,000 toward the purchase.